Patjens Lake Loop Trail returns along Big Lake offering watery views. Wear lightweight pants as you’ll need to do some bushwacking to get to these tiny lakes. Carry plenty of bug spray unless you hiking when there’s still snow on the ground because there are loads of mosquitoes out there. Pack water and lunch or a light snack to enjoy during the 2nd half of your walk. Wading is possible in the smaller lakes as they are so shallow and not much good for swimming (save that for your return to Big Lake on the loop back). This is a dense pine forest leading into some rather ‘refreshing’ elevation gains along the way. The left fork just after the trailhead takes you to the lakeshore, the right leads to Patjens (hidden) Lakes (see map). 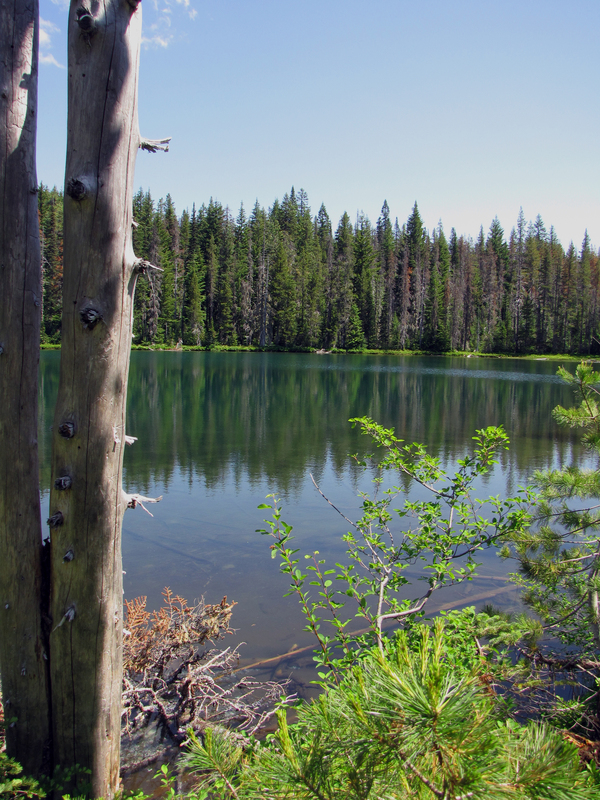 Patjens four smaller Lakes will be hidden in the pines as you venture along the trail and you’ll want to keep on your toes in order to not miss them. Watch for openings in the forest and prepare to mash through the bushes to glimpse these hidden treasures. This is one of the lakes you'll find along the return loop trail. This trail is moderately challenging and at certain points you’ll wonder where those lakes went to, but after you get over that first elevation gain and begin to loop back around the trail you will catch some glimpses of water. Head in that direction. Again, if you visit this trail after the snow has melted and after the bugs have bloomed, you’ll be very grateful you did not forget your bug spray. And, in which case, now is a good time for a quick picnic or just a pause to take in the views and snap a few photos. The trail back offers some great view of Big Lake and nearer to the trailhead some spectacular shots of Mt. Washington, back over your shoulder. What you’ll see: a few trail hikers, a few fellow trail dogs, lots of bugs, great views of Patjens Lakes, Mt. 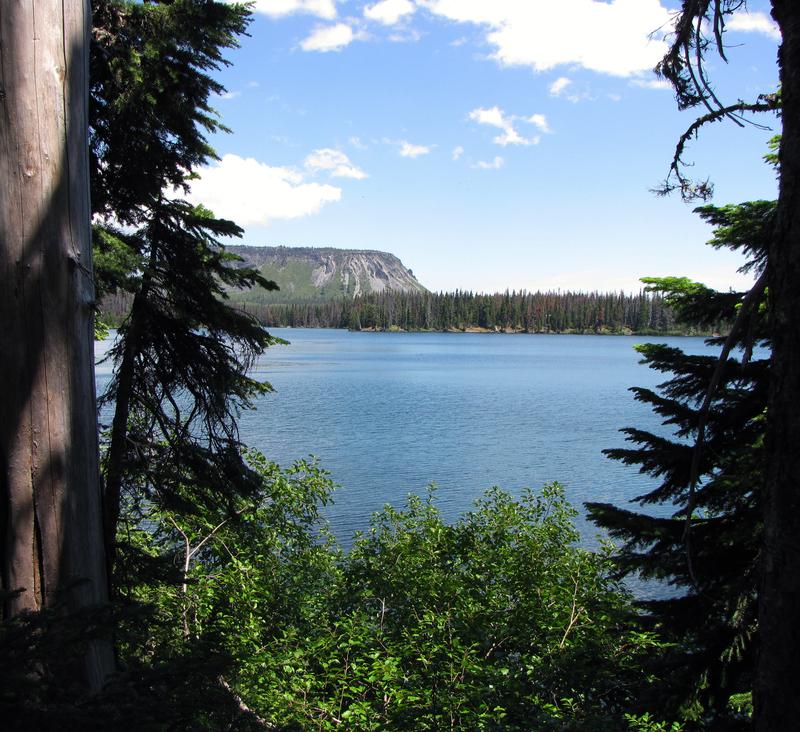 Washington and Big Lake, tons of forest pines including lodgepole pine, western hemlock, and alpine fir. At Big Lake you’ll see loads of boaters, water skiing, campers and fishermen. Overall, it’s a pleasant hike, somewhat challenging and the dogs will enjoy the experience. You will need to be watchful of deer and keep your pooch in check. And be sure to pack water for the canines and keep your leash handy for potential fellow-hiker encounters. No bugs in August. Forest is totally burned. Only green is bear grass, lupine, few other grasses and flowers. No live trees except a bit around part of first and second lake, and on “ridge portion” of loop. Otherwise charred dead trunks. Lakes are totally obvious through dead trees. Dusty, ashy, no shade once you leave Big Lake shoreline. Few birds, little wildlife, few humans beyond Big Lake campsites. Dogs coughing and choking on dust and ash. Lakes are still clear and thigh deep. Only redeeming quality– seeing a devastated charred forest beginning to come back to life from ground up– for 5 monotonous miles.